Wake up to these wonderful breakfast options in Mesa, Arizona! 5 Breakfasts to Wake You Up! Everybody loves a good breakfast. Some even say that they fall asleep excited just to wake up in the morning and eat breakfast. We know that happens to us. Well, when you think about it, why wouldn’t it? Bacon, eggs, sausage, oh my… our stomachs are rumbling just thinking about it. One of the best things about the Mesa restaurant scene is that many of them are open for breakfast, and these breakfast meals aren’t just any breakfast meals. There’s always something about them has a signature Mesa twist, and this twist is one that you need to try. Like, A.S.A.P. Here’s some ideas to get you excited to set your alarm tonight for tomorrow’s breakfast! These are two dishes you do not want to miss. Schnepf Farms is known for its abundance of fresh peaches (as well as hoards of other fruits and vegetables) grown right here in Mesa City Limitless. So, what better way to celebrate fresh peachy goodness than by adding it to incredible fresh cinnamon rolls and piping hot pancakes? Where better to have breakfast than somewhere featured on Food Network’s Best Thing I Ever Ate? Try this perfect blend of sweet and savory. Start with the Arcangelo Eggs Benedict, frittata with tomato and avocado on focaccia bread, served with smashed potatoes and balsamic cured pepper bacon. Then, move on to Belgian waffles covered with fresh banana compote, syrup, and pecans. Your taste buds will thank you, and you’ll start your day off full of Mesa-grown yummy breakfast! One of Mesa’s pride and joys, featured on Food Network’s Diners, Drive-Ins, and Dives, is Joe’s Farm Grill. If you’re a big fan of sweet and savory, this famous dish is perfect for you. Foodspotter user Critsy has this to say of the breakfast: “Belgian waffle with butter, choice of syrup, topped with four smoked baby back ribs—a tasty combo destined to become a comfort/soul food classic. Waffle is perfect—fluffy inside, crispy outside. Their baby back ribs are super tasty and tender! I could eat this for breakfast everyday! !” Get down to Joe’s Farm Grill NOW. We need this combo A.S.A.P. Another family favorite is Rancho de Tia Rosa in Gilbert. 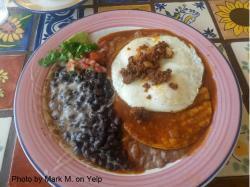 Fresh eggs served with beans, chorizo, and salsa? Enough said. Tell us what your favorite breakfast spots are in Mesa CityLimitless! Use #MesaCityLimitless and tag us on social media. We’ll be drooling over those Insta-worthy images of pancakes, peaches and piping hot coffee. Cheers!